Arkham is definitely one of the PhysX poster children and we'd be amazing if the GTX460 does anything but romp away with this test. Even with a 4GHz quad-core pumping beneath the hood it should still be a walkover for the green corner. So it proves to be with both of the GTX460s taking a healthy lead at the top of our charts. The minimum frame-rate is where the Radeons really take a bit of a battering, although it has to be said that considering the image quality we're running, even the little HD6850 never drops below 60FPS at any point. How far technology has come. Demonstrating the power of the nVidia GPUs, especially when it comes to calculating the physics whilst rendering the graphics, once overclocked the lead gets even greater. The HD6 series cards hardly gain at all as they are already easily coping with the image part of the game. 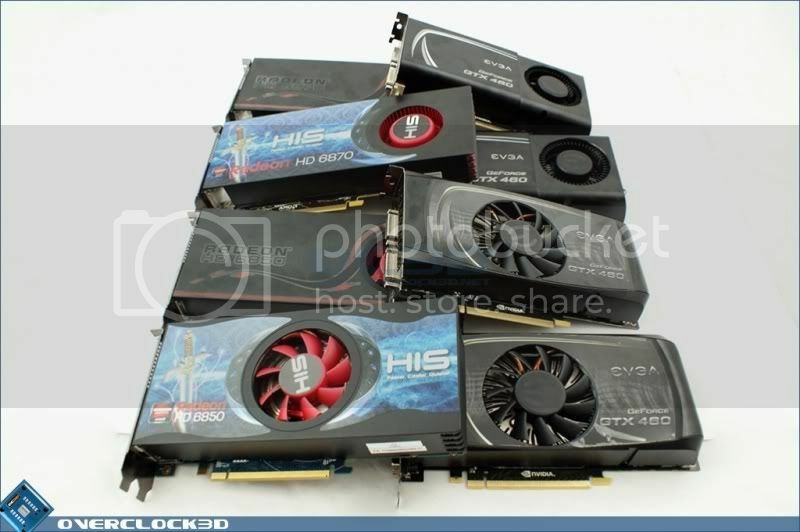 As the GTX460s are also used for the PhysX the overclock gives massive gains across the board of 14 and 16FPS. Considering even the worst stock single card result we got was more than good enough for Arkham Asylum, this definitely is a bit of GPU overkill. It does however provide us with our first real surprise. Both minimum and maximum frame-rates follow exactly how we'd expect them to do, but when it comes to the average frame-rate the GTX460 1GB slips a long way behind the GTX460 768MB in a SLI setup. So far behind that the HD6870XF edges ahead. Proving the stock result wasn't a one off, again we have the 768MB GTX460 ahead of its larger RAM'd brother. Not by as much and when you're dealing with frame-rates in the 200s then 18FPS isn't really here or there. Nonetheless it's an oddity. The overclock does mean that the HD6870 slips back into third place but really all of these cards are more than capable of handling Gothams finest.